Hi all! The weekend is among us once again! YIPPEE! I hope to be doing some crafting this weekend. I haven't had the opportunity to craft for hours like I would like - but this weekend I hope to get some cards done, and look into some ideas for some wedding invitations that I have been asked to make for an upcoming wedding!! 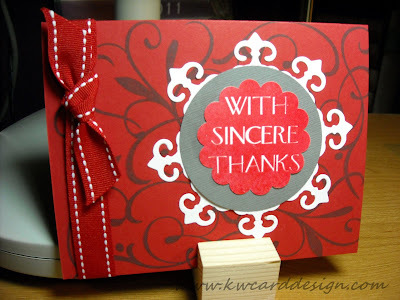 Today - I wanted to share a Thank You card I made. I love to get new ideas on how I can use the products I already have, and I saw this video from StampTV on how to make a border with your Spellbinders Dies. I just love this idea. It is simple - but my oh my, does it ever make a beautiful effect! I used this stamp from Hero Arts for the background. You really can't tell in the photo - but the greeting is embossed with red - and the "sincere thanks" is embedded. It looks like I embossed with white embossing powder, but in fact used red, and punch it out with my scallop circle punch. Hope everyone has a nice weekend!! Let's us all pray for Japan and I hear that they were hit hard again with another earthquake. Makes you really thankful for the little things, and take joy in everyday. YouTube & FB - getting my name out there! Don't ya just love birthdays?